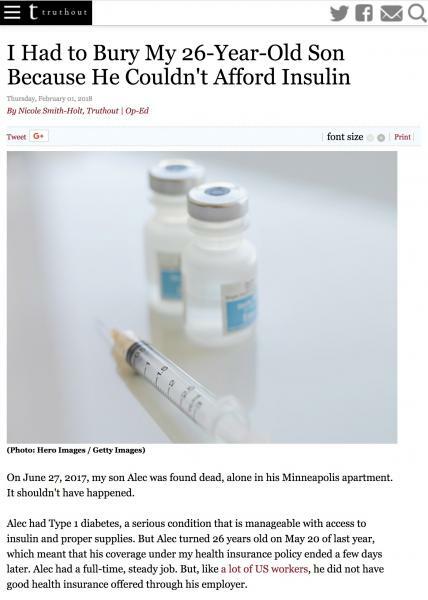 Nicole Smith-Holt’s son Alec died in Minnesota last June--after being forced to ration Eli Lilly’s Humalog insulin when Alec, a person with type 1 diabetes, could not afford the radically-increased price of the medicine. Ms. Smith-Holt wrote about Alec’s experiences in this February article. Ms. Smith-Holt will be attending the Eli Lilly shareholder meeting on May 7th and will pose a question to the company’s CEO and Board of Directors during the Q and A session. Ms. Smith-Holt, along with T1International and People of Faith for Access to Medicines will be holding a press conference outside of Eli Lilly Headquarters before the company’s shareholder meeting, a legally-required event also known as the Annual General Meeting. WHEN & WHERE: Monday, May 7th at 10am Eastern (before Ms. Smith-Holt goes into the meeting) at the 800 block of South Delaware Street in Indianapolis, Indiana. BACKGROUND: Insulin, an essential medicine, was first used to treat a person with diabetes in 1922. Its discoverers sold their patents for $1 each, with the intention that it be accessible for all. Now, almost 100 years later, the cost of insulin is increasingly unaffordable for people living with diabetes in the USA, causing people to ration insulin and skip injections. Physicians report seeing an increasing number of insulin-deprived patients coming into emergency rooms in crisis. Half of those who need insulin cannot reliably get access to it. High prices are leading to bankruptcy and death. Eli Lilly and Company is one of three manufacturers of insulin. In near lock-step with the other two manufacturers, Lilly has raised the price of its version of insulin by over 300% over the past seven years. A U.S. patient’s out-of-pocket cost for a month’s supply of Eli Lilly’s Humalog can be over $400. The company’s revenues on Humalog rose 12% in the first quarter of 2018. Although manufacturers like Eli Lilly keep the cost of insulin production a tightly-guarded secret, U.S. prices are likely hundreds of times higher than the expense of making the drug. The insulin price increases have been called “price-gouging, plain and simple” by U.S. senators and a “racket” by an endocrinologist writing in the New York Times.